High school reunions can be awkward. 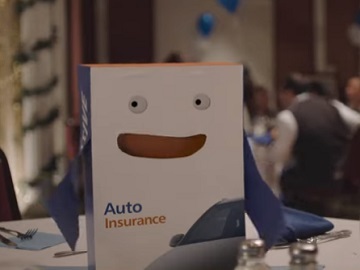 Saving up to $668 when you switch car insurance doesn’t have to be, Progressive says in its latest commercial featuring the company’s longtime mascot, The Box. This time, The Box attends a school reunion, where he meets his WBHS class of ’98. “Oh, crew, remember when we all used to go the cafeteria and just chown down midday?” he asks his former classmates, who can’t help “translate” his English. “You mean like lunch,” one of them clarifies. He then reminds that he was voted the most likely to help people save six hundred sixty eight dollars when they switch, but no one remembers. A woman asks if at their school and a man asks him if he wasn’t the one that got caught in the laminating box. Later on, reading a greeting from a former classmate named Danielle, The Box chooses a slow song and announces a special discount for a special girl who’s none other than Danielle. Last year, the Progressive Box was the protagonist of the insurance company’s Super Bowl commercial. Created by agency Arnold, the spot aired at halftime. Super Bowl LII took place on Sunday, February 4th, 2018, at U.S. Bank Stadium, Minneapolis, and was broadcast on NBC. This year, Super Bowl will take place on Sunday, February 3rd, 2019, in the Mercedes-Benz Stadium in Atlanta.